The Hilton Nairobi Hotel dominates the city centre with it’s typical round tower building, occupying almost a whole block. The hotel is a high-rise that will provide you with some great views if you are staying on the upper floors. The hotel offers a range of services. There is a beauty salon and gift shop on the premises, as well as 24-hour room service. You can also stretch your legs at the fitness center or spend some time lounging in the pool. There is a health club as well, where you can work out the stress of your vacation with a massage. Cribs and a babysitting service is available for travelers with small children. All of the rooms are air-conditioned and are equipped with high-speed Internet access and cable television. You can also choose a non-smoking room. If you are staying in Nairobi for business rather than pleasure, you'll find it suitable with fax services, meeting rooms, a/v equipment rentals and a secretarial service. You'll find that the food and dining facilities inside the Hilton to be much more international than African at the Hilton Nairobi. The Traveller's Restaurant offers dishes from around the world, as well as Kenyan specialties. The Sale E Pepe is a classic Italian restaurant, decorated as a traditional trattoria. The dress code prohibits shorts, so expect to dress up a bit for dinner. Both the Jockey Pub and Pool Garden restaurant are much more casual, offering up cocktails, sandwiches and local grilled meats. And finally the Café American is the place to go for a fresh pastry and cup of coffee. The biggest tourist draw in Nairobi - Nairobi National Park - is just 9 miles from the Hilton. You don't need to sit in a jeep for 6 hours to find a good safari. Don't be fooled by the city location either. The park is excellent and you're almost guaranteed to see black rhinos, lions, giraffes and more African wildlife. Some other Nairobi attractions that are just within a few miles of the hotel are the Ngong racetrack, the National Museum, the Karen Blixen Museum, the Ostrich park and the Kenyatta Conference Center (which is at walking distance). Sport clubs in the area can provide you with golf, squash and tennis. Like most major hotels, you'll find the Hilton Nairobi right in the heart of the city, around 20 minutes from the main airport by car. That's a quick taxi ride away, or arrange for a free hotel shuttle bus to pick you up. The hotel in on Mama Ngina street, just beside the largest craft market in the city, where you can buy traditional Kenyan products. For more information or a quotation, check this hotel at Africapoint. This friendly and patient Nairobi-based travel agency knows all hotels in Nairobi and can tell you personally whether it's this hotel that suits you best, or another one. Their rates are often very competitive. Another good source to check this hotel is Hotels Combined since they have user reviews, information, pictures etc. online. 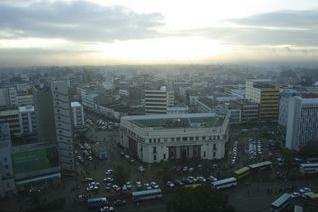 Compare their Nairobi hotels here.